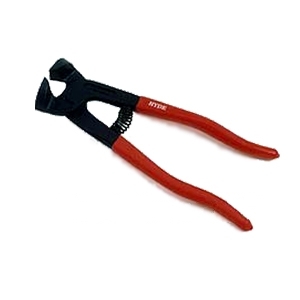 PRODUCT: 8 inch Long Carbide-Edge Steel Tile Nippers. High Quality Roof Tile Nippers. Made in USA by AJC. Price/Each. 5/8" wide jaw x 8" Handle Carbide Tile Nippers, for shaping roof tiles. Cuts tile up to 1/2" thick. Carbide cutting edges. 5/8" wide offset jaws open with return spring. Tool measures 8" overall.